Over the years, technology has literally changed what is possible within dentistry, but all too often it is too complex. It takes you out of your comfort zone. It feels disconnected from your existing activity. It requires too much training. And it is not patient-friendly. This is the reality that AmericaSmiles and Carestream Dental are challenging. We believe that highly complex and sophisticated technologies should translate into simple solutions that compliment your work, not complicate it. Purchasing the CS3500 through the AmericaSmiles Network means you are buying the product your lab partner can support. AmericaSmiles Network dental labs are a part of a national association dedicated to advancing the quality of dental care. When your lab is an AmericaSmiles lab, you can be assured that they have the knowledge, talent, and expertise needed to support your move to digital dentistry. 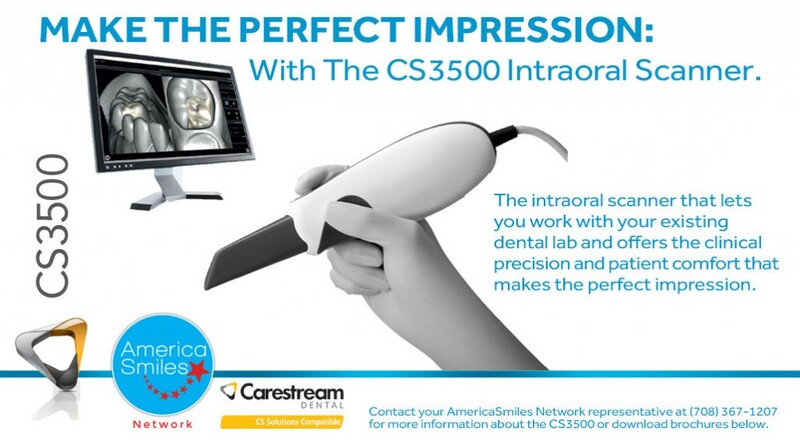 Contact us today to learn more about how you can make the perfect impression with the Carestream CS3500 intraoral scanner.